The new Italian heartthrob is stylish, fast, retro and modern all at once. A sleek Italian is in town. No, it’s not a sports car. It’s not even the latest big-screen heartthrob. It is, in fact, a stylish 60-foot motoryacht from Azimut that can get everywhere quickly and make a statement when it arrives. 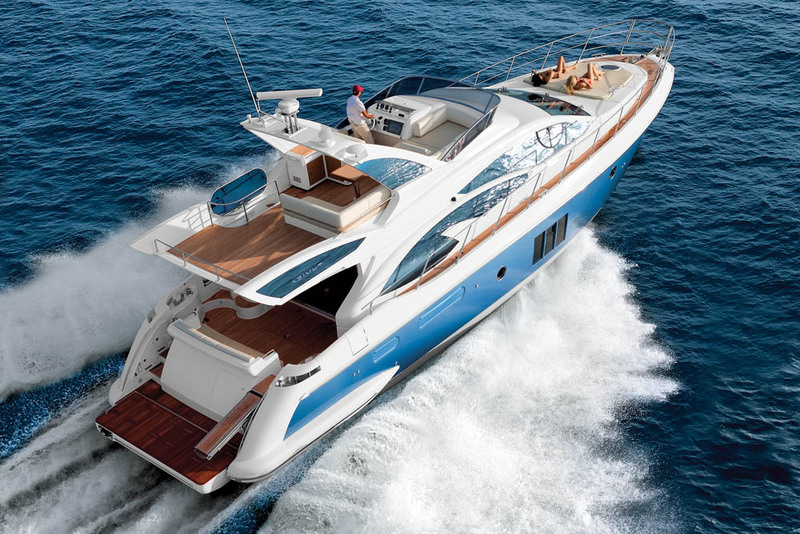 In late 2012, Azimut refreshed its 58-foot design and re-launched it as the Azimut 60 Flybridge, which is still positioned toward the middle of the Italian builder’s 12-model fleet, which ranges from 42 to 100 feet. Although the design was based on the same hull and propulsion package as its predecessor, the new model benefited from a few tweaks and updated styling that have given it a contemporary appeal. The exterior styling of Stefano Righini shows a sleek hull with a high bow and 15 and a half degrees of deadrise at the transom. Three rectangular windows appear on both sides, just about in the middle of the hull. Azimut was among the first to use this aesthetic to bring light into the master stateroom below, and their angular shape is in sharp contrast to the swoopy and irregular cabinhouse windows above, as Amizut mixes it up a bit with the profile. The flybridge is topped by a composite arch and has Cadillac-style fins on the aft-most side sections of the overhang. They add a retro vibe, as do the additional and traditional round portlights in the forward sections of the hull. 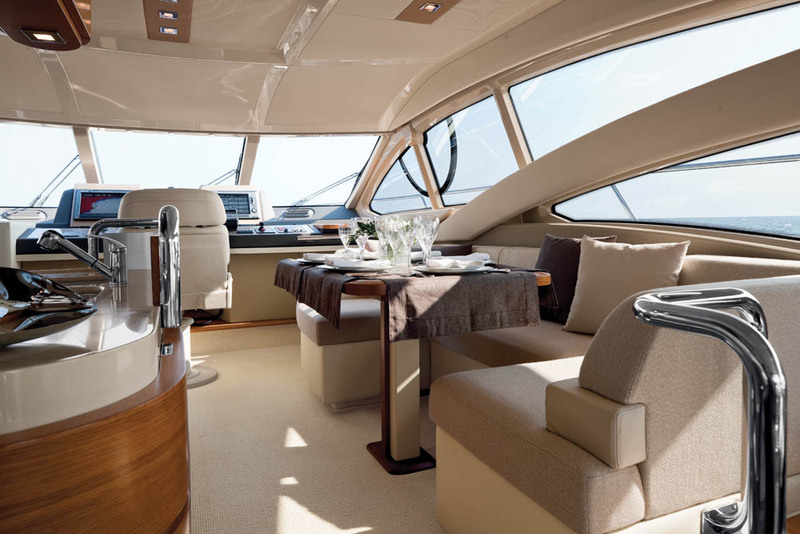 The windshield of the cabinhouse is raked back at a significant angle, adding to the perception of movement and hinting at the yacht’s speed. This is a very modern-looking motoryacht — the kind you may fantasize about weekending aboard in St. Tropez, perhaps surrounded by buzzing paparazzi. As on many other models, the swim platform on the Azimut is hydraulic and serves as a teak beach when it’s partially submerged. Unlike on other 60-foot models, however, the platform is a standard feature, which represents a good value. You can use it for easy boarding from the dock or to carry a tender or PWC. The platform also provides access to the crew quarters via a door built into the transom. This space will accommodate two normally, but only one when the optional Seakeeper stabilizer is added. 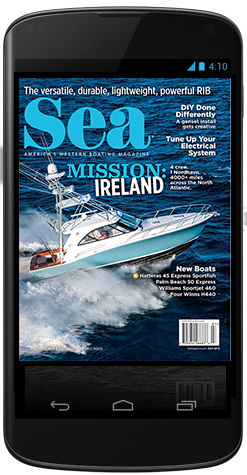 To port are steps that lead up to the cockpit, and to starboard is a passarelle that would connect the main deck level to a dock in a Med-mooring situation — not something West Coast boaters deal with very much. However, capstans both port and starboard could come in handy for hauling in a stern anchor or a mooring line, and because they are mounted at near waist level, there won’t be much bending over or straining your back. A straight seat for four is built across the transom. 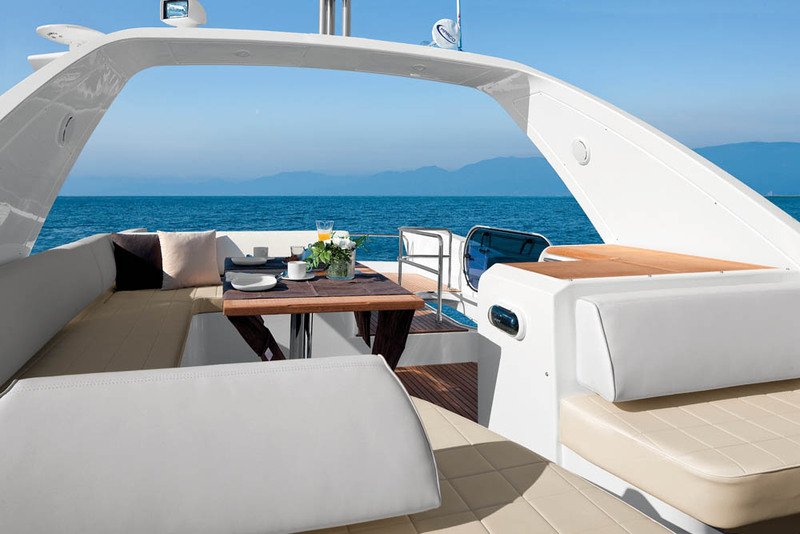 With the optional table and some freestanding chairs, this would make a nice place for an alfresco dinner, since the area is mostly protected by the hardtop formed by the flybridge deck. Gates on both sides allow boarding or disembarking when the boat is lying alongside a dock. Again to port are steps and a nice-sized handrail that lead from the cockpit up to the flybridge. Here, nearly the entire starboard half is dedicated to a dinette and an extra lounge that also serves as the companion seat. To port is an L-shaped console with an optional grill and a wet bar for entertaining. 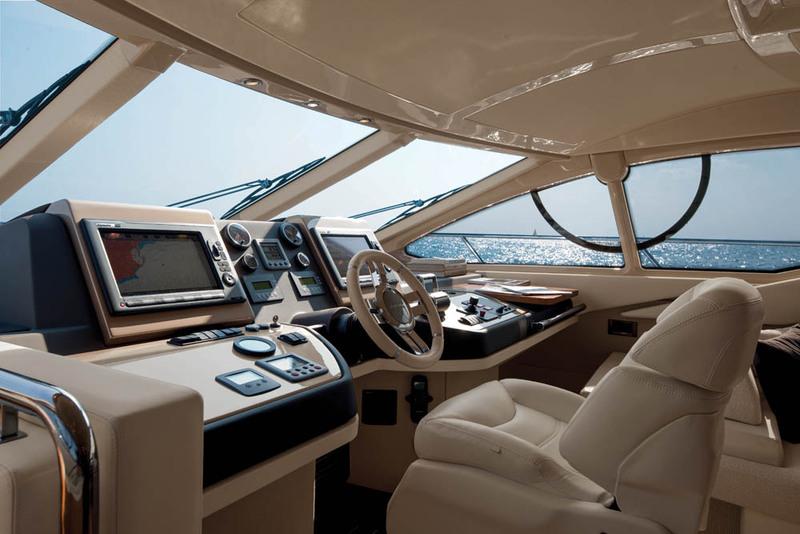 It sits just aft of the helm station where there is a double seat and a comprehensive dash with a single Raymarine multifunction display and switches for key systems. Using the arch as an attachment point, the entire forward section can be enclosed, from the small reverse windshield to the open deck aft where there is enough space for a nine-foot RIB and an optional 550-pound davit. From the helm, the captain has good visibility forward over the double sunpad on the bow and to the anchoring area. A camera will come in handy for viewing the aft corners when backing up. Raymarine backing, engine and thermal cameras are optional. This is a big flybridge that will entice many guests to linger over sundowner cocktails. If enclosed, it makes an all-weather room with the best views of the anchorage. Inside, more changes were added to enhance the aesthetics and comfort. I stepped through the glass sliding door into a salon where the windows have been enlarged to let in even more light. The high-contrast colors of the upholstery and wood finishes had a striking effect. An L-shaped settee is to port while to starboard owners have the choice of a built-in entertainment center or an additional sofa with just a corner unit to house the flat-screen TV. Two steps lead up to the dinette to starboard, which will accommodate four people easily, and is across from the U-shaped galley to port, which has become the focal point of the interior. 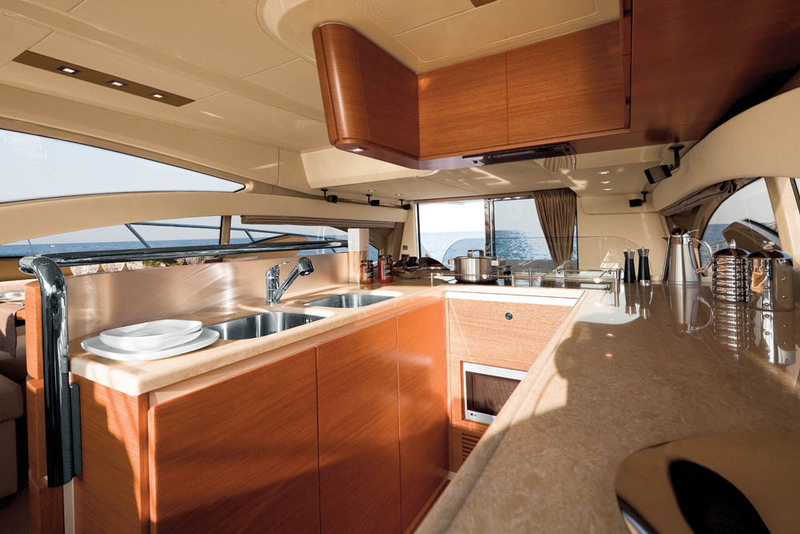 Unlike on its other models, Azimut chose to keep the galley open, so the chef is integral to the social scene. The half bulkheads that form it are rounded, to create a unique visual appeal, almost like the styling of a retro diner, but they will also help cut down on boat bites. In fact, the entire inward bulkhead forms a soft curve and is topped by a useful stainless handrail that adds to the design as well as the functionality. Overhead cabinetry provides extensive stowage space, and the windows that continue at this level make the whole area very light and livable. Standard kitchen features include twin sinks, a microwave/convection oven, a Miele induction stove with an overhead vent and two Isotherm half refrigerators. The neat differentiators are the custom lockers that hold dishes and cutlery. The visibility from the galley is excellent, because you can see forward via the expansive windshield, aft all the way past the salon and out to the cockpit through the glass slider, and out to either side. Nobody will ever feel buried or cut off from the conversation in this galley. I felt the heat radiating from the sloping windshield as I sat down at the single centerline helm seat. Due to its angle, the expanse of glass generates quite a bit of solar heat, and there is no sunroof overhead to mix in cooler air. To starboard is a companion seat, and to port steps lead down to the cabins. 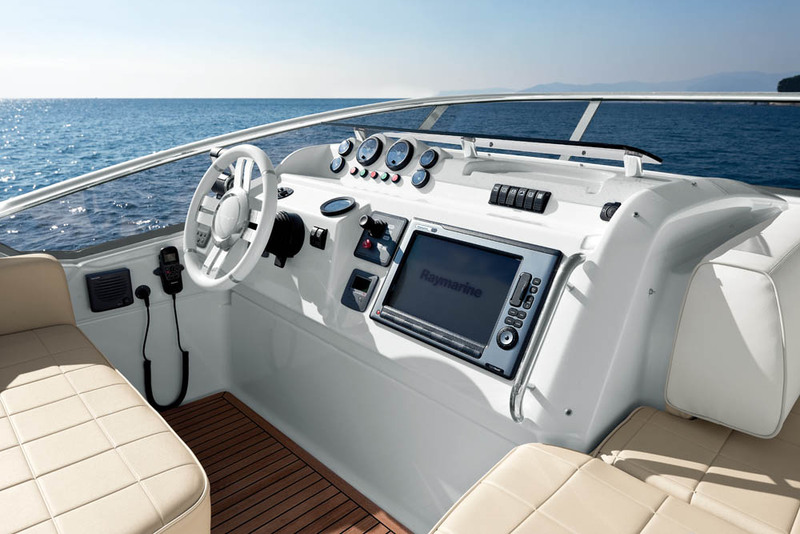 The dash ahead is impressive with twin Raymarine G Series MFDs separated by a panel of gauges above the wheel at the center. The Xenta joystick and engine throttles are to starboard. The Azimut 60 is not a pod-driven model, but it does have the builder’s Easy Docking feature, which integrates side thrusters and the engines to let you maneuver in tight quarters like a pro. Below, there are three cabins and two heads. 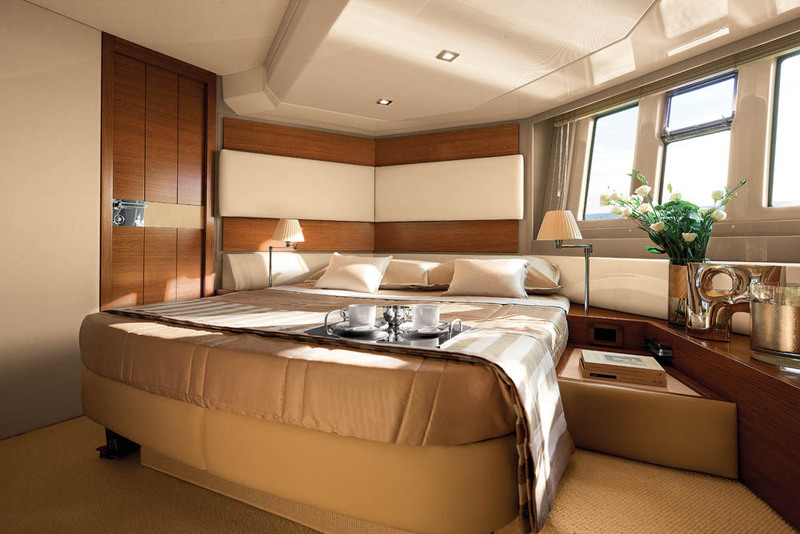 The VIP stateroom forward has a centerline queen bed and an overhead hatch for air and light. The centermost of the three hull ports on either side also opens for even better ventilation. This cabin shares the second head with the twin stateroom to starboard. The master stateroom is amidships with the bed on a diagonal. The head of the bed is to port and close to the three large vertical hull windows, so the owners have a view from the moment they wake up. To starboard is a very large dinette or desk area where a couple can have a private breakfast or catch up on some laptop work. The bath is full beam and aft of the cabin, which places it between the stateroom and the engine room, so it provides a bit of sound insulation. The twin MAN R6 800 hp engines are accessed via a hatch in the cockpit rather than through a door from the crew quarters. 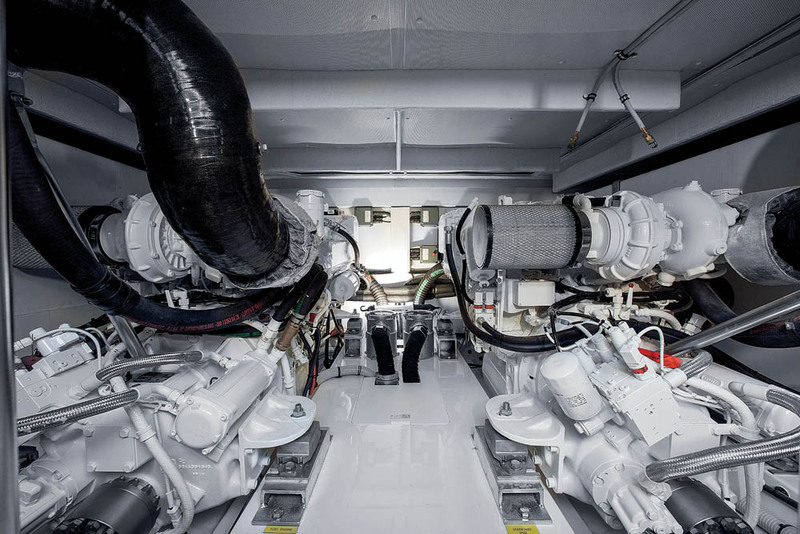 It’s a compact engine room that includes the Kohler genset mounted aft. Overall, there’s adequate access to key systems for quick basic maintenance. There is no upgrade option for the propulsion, but there is no need for bigger engines, as our test on San Diego Bay proved. I headed out with Peter Zaleski of MarineMax on a typical Southern California day. The bay was flat and the breeze was 8 to 10 knots. Zaleski demonstrated the ease of maneuvering from either helm and with the Yacht Controller joystick remote. Tight slips will not be your nemesis. We topped out at 31.1 knots at 2300 rpm while burning 87.7 gph at wide-open throttle. A reasonable cruising speed can be found between 1800 and 2000 rpm and 21 to 26 knots, where fuel burn is roughly 51 and 67 gph, respectively. Depending on your point of departure, say between Newport Beach and Long Beach, you could be to Catalina Island in just 70 to 90 minutes. I noted that we came up on plane in 14 seconds just as we passed 16 knots. On plane, we made gradual turns where the boat put its shoulder down and sliced through the water without any skidding or slipping. We made graceful S-turns that weren’t sharp or drastic but rather slow and even. The wind was low and there was no chop in the bay, making the ride as smooth as silk. LOA 60 ft., 2 in. Beam 16 ft., 3 in. Draft 4 ft., 6 in. Twin MAN R6 engines, 24 kw Kohler genset, electric windlass, hydraulic swim platform, bow thruster, electric heads and more. 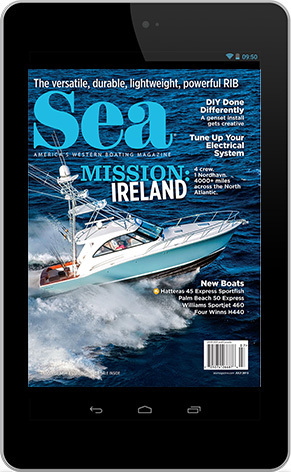 Seakeeper gyro stabilizer, joystick control, Raymarine electronics, dual Racor filtration, Glendenning CableMaster, crew quarters, additional starboard-side salon seating, flybridge hardtop, Zebrano wood color, washer/dryer, teak on sidedecks and flybridge, bidet and more. 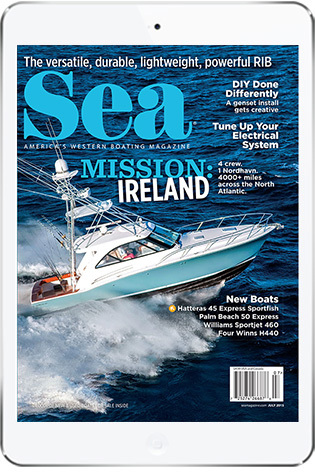 This entry was posted in Boat Tests, New Boats and tagged motoryacht, flybridge, Azimut, italian by bsheehy. Bookmark the permalink.